Thanks for spreading the info. At last test, battery was flat. I imagine it is likely the thing has no shot without the missing components. And given the guy I got it from got it out of a recycling place, who knows what may not have been thought of as a component that got left behind. For me, I'd also love to learn more on the history of this thing even if no useful code is recovered. I will likely get this sucker into a display and make it a quirky centerpiece of the sega channel collection of stuff (and there is more than I'd imagined). Just wanted to say for anyone wanting to see a lot of cool promotional material along with the prototype of the unreleased Klondike game from the service...there is now a display up for the service at the National Videogame Museum outside of Dallas, TX. "Ozone Kid" - any ideas? Looks like this appeared in some form at Summer CES 1992 as "Environmental Detective". Developers Magicom presumably sat on it for a couple of years, gave it a different name and spat it out on Sega Channel. - Body Count wasn't released in the US and its existence on Sega Channel is news to me. 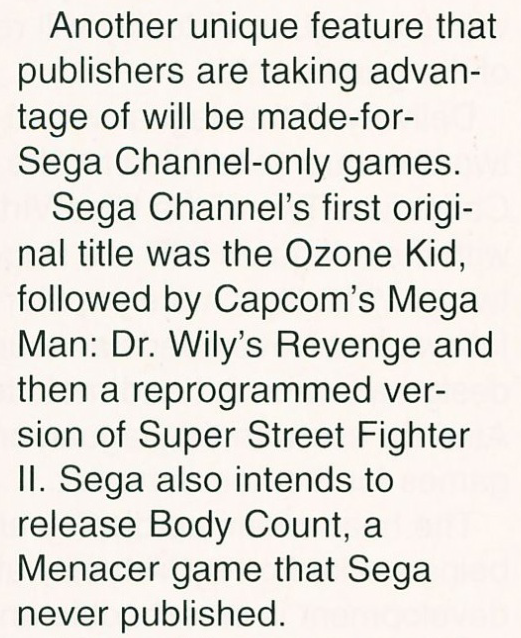 Dr. Wily's Revenge is the name of the first Game Boy Mega Man game. Did EGM make a mistake, or was that a planned title for the Mega Drive release as well? In Japan it's known as Rockman Mega World, whilst the Game Boy game is Rockman World. EGM weren't very good at the whole "video game journalism" thing so you can probably assume it's a mistake. Documentation on "Super Street Fighter II L.E." was in the Sega Channel haul from a while back, although not the ROM itself (Though based on the information it has it could theoretically be recreated). You can find it in the Instructions Test ROM. EDIT: also put an image dump of the contents on my Twitter.